(Nanowerk Spotlight) In a toxicological context, exposure to nanomaterials primarily occurs through dermal, inhalation, ingestion or injection routes. The complicating factor in toxicological studies is that nanomaterials can distribute from their exposure site and accumulate elsewhere in the body. The liver is one of the major organs targeted by nanoparticles either due to their translocation from other primary organs such as the lung or as a result of significant bioaccumulation after their systemic administration. Among engineered nanomaterials, metal oxide nanoparticles are manufactured in large quantities and used in numerous consumer products such as food, cosmetics, fuels, clothing as well as biomedical applications. This wide used increases the risk of human exposure to these materials. "While there have been studies that explored the toxicity of limited numbers of metal oxide nanoparticles in liver cells, there has been no comprehensive work that explores the hepatotoxicity of various metal oxide nanoparticles and investigates their mechanism of adverse impacts in relation to pathways of toxicity in different liver cells," Vahid Mirshafiee, a postdoctoral scholar at the Center for Environmental Implications of Nanotechnology at UCLA, tells Nanowerk. "Significant bioaccumulation of nanomaterials in the liver via inadvertent or systemic exposure, as well as the lack of a mechanistic knowledge that describes the hazard potential of metal oxide nanoparticles in liver cells, prompted us to comprehensively explore metal oxide nanoparticle interactions with major liver cells, including phagocytic cells and hepatocytes." In a research article in ACS Nano ("Toxicological Profiling of Metal Oxide Nanoparticles in Liver Context Reveals Pyroptosis in Kupffer Cells and Macrophages versus Apoptosis in Hepatocytes"), first-authored by Mirshafiee and Bingbing Sun, a research team led by Drs. André Nel and Tian Xia at UCLA assessed the toxicity of 29 metal oxide nanoparticles in liver macrophages (Kupffer cells) and hepatocytes. So far, this is the most comprehensive study for the profiling of mechanistic injury responses in liver cell types, which significantly extends the understanding of metal oxide nanoparticles toxicity in the liver. One particular problem for the analysis of nanomaterial toxicity regarding the liver is the nanoparticle dose adjustment. In pulmonary exposure studies it is possible to utilize human inhalation exposure studies to perform dose calculations. However, in cellular studies it is not possible to select certain nanoparticle concentrations without a detailed knowledge about real-life nanoparticle exposure to a particular organ. For this reason, the scientists selected a wide dose range of nanoparticles for their in vitro toxicity profiling to ensure they cover potential real-life in vivo exposure doses. Based on their toxicological profiling, they observed distinct cellular response profiles for metal oxide nanoparticles, as well as differences between hepatocytes and Kupffer cells. In addition to providing a thorough toxicological screening for a large number of metal oxide nanoparticles, this work also describes detailed cellular pathways in relation to their cytotoxicity. "Our work is in agreement with previous results that explored the hepatotoxicity of limited metal oxide nanoparticles such as Fe3O4, TiO2, and ZnO," notes Mirshafiee. "However, comparison of the cellular response profiles in two major liver cell types and the discovery of differences in cell death mechanism and the occurrence of pyroptosis in Kupffer cells and phagocytic cells by rare earth oxide nanoparticles are novel findings." 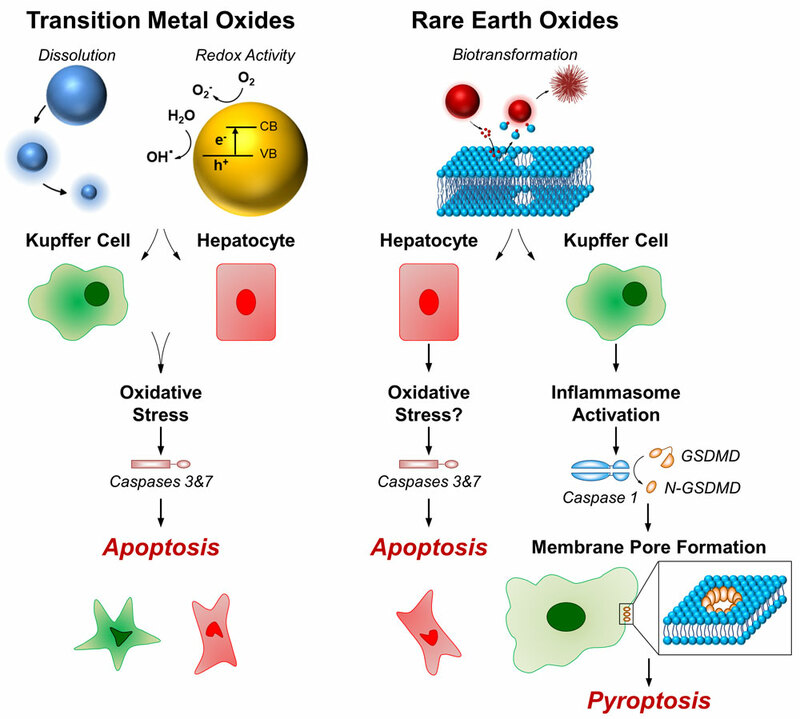 The researchers found that highly soluble and redox-active metal oxides (e.g., Mn2O3 and ZnO) induce apoptosis in both cell types, which was mediated by oxidative stress. In contrast, rare earth oxides (e.g., La2O3, Gd2O3) induce significant toxicity only in Kupffer cells, a process that is mediated by intracellular organelle disruption (lysosomal damage) and inflammasome activation. Furthermore, rare earth oxides induce a highly inflammatory programmed cell death (pyroptosis) in Kupffer cells and other phagocytic cells. This form of cell death was accompanied by cell swelling, membrane rupture, and release of inflammatory cytokines (IL-1β). The scientists point out that these findings demonstrate important mechanistic knowledge with regard to liver toxicity of metal oxide nanoparticles that could be helpful for safety evaluations of commercial products that contain these materials or more generally the development of safer engineered nanomaterials. For instance, this kind of comprehensive analysis of metal oxide nanoparticle toxicity in liver cells allows the development of structure-activity relationships – correlating metal oxide nanoparticle toxicity to its physicochemical properties – that could be utilized to modify specific nanoparticles' characteristics. "In addition, our mechanistic in vitro study in combination with future validating in vivo experiments could be used to develop 'adverse outcome pathways' that can be useful for safety screening of any other metal oxide nanoparticles or commercial products in the liver context," says Xia. "In this present work we explored the hepatotoxicity of metal oxide nanoparticles; however, more studies are required to investigate the potential adverse impact of other engineered nanomaterials to the liver and mononuclear phagocyte system," Nel concludes. "This becomes particularly important when one considers the potential for a significant deposition of engineered nanomaterials in this organ after exposure."